I love a good candle, especially one that smells strong and lasts a long time. 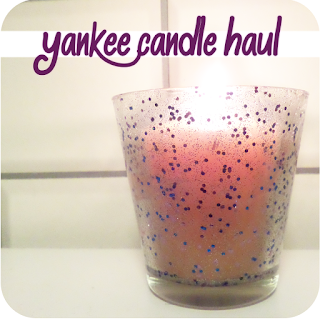 So far in my search the closest I have came to happiness is with Yankee candles. So seeing there Christmas range out in asda I just has to pick up a few. At £1 each you really cant go wrong. Inone of my posts i had shown what I like to use to burn my candles, and I also use it for burning these wax votive candles. I take a butter knife to scratch out the metal disk at the bottom of the candle and then pull out the wick. I think this helps them last much longer and also means you can pop the melted disks under radiators to fragrance the house on chilli days - just remember to put them on a plate. So the fragrances I got this time were three of the Christmas scents and also a three pack of basic home scents. I'm useless for actually describing scents but when I goggled the festive ones for an 'official' scent description I found it hard to find them. Even to find them for sale was a little difficult as the prices were much more expensive than what I paid. The festive ones 'Christmas Baking' I can smell a hint of cinnamon as for the rest merry berry is fruity with a cherry note and savour the season I would say is also a baking smell but not as spicy. I told you I wasn't very good, so next time your in any shop that sells them please do give them a sniff, they really are divine. As for the other three candles they are really easy to describe as they are part of the core collection and really smell like how you expect with there names: Raspberry Sunday, Sweet Vanilla and Apple Crumble. There is just so much selection from this brand it really is amazing. Amazon does so many diffrent scents all year round its hard to make sure my pennys stay in my pocket. How do you like to scent your home? Or do you have a favourite candle brand? My mum loves a good Yankee candle also. I prefer diptyque. Pricey but they smell amazing! I love candles and hearing you got these in Asda made me add to my list of things to get today. 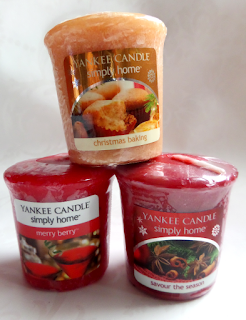 Who doesn't love a yankee candle?! I love the Christmas collection too, so festive, and lovely! I love the smell of peppermint! They have an xmas candle which is named something like 'silver candycane' and it smells like peppermint. Its amazing and i cant wait to get my hands on it. They are just amazing! Cant get enough of them. I love candles! I need to get some Christmas friendly ones like these!